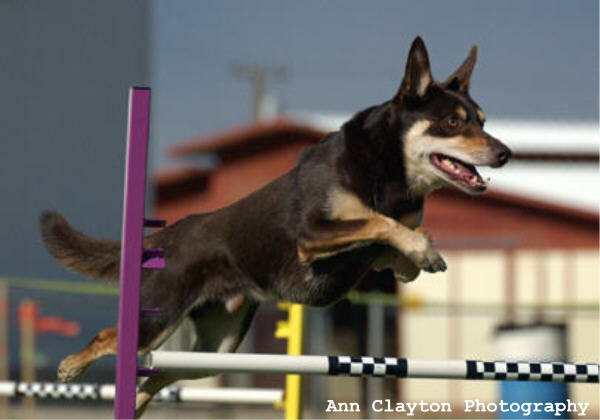 Flink, my 11-year-old Kelpie and an 8 Champion agility dog, was diagnosed a year ago with laryngeal paralysis, a condition that eventually results in heat stroke if not corrected. The surgery for this condition leaves the dog vulnerable to aspiration pneumonia. We performed the surgery for this in mid-November. I considered asking SCAF for help with the cost of this surgery but decided that this was my responsibility. However, 2 weeks after the surgery, Flink had a 105.2 degree fever and was having difficulty breathing. Flink was diagnosed with pneumonia. 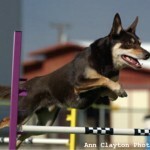 He spent 5 days in intensive care in a canine emergency clinic. Since then the expenses connected with this (he has had another bout of pneumonia) have continued to grow. I applied for and received a grant from SCAF. The amount was not a huge percentage of the financial burden I was facing, but it helped. Even more, it represented far more than financial relief. That check represented the caring of a group of dog people who understand how important our dogs are to us, that we stick with them through the good and the bad, that what happens to them matters deeply to each of us. It helped me get started on payments at a time when I was reeling from the cost of Flink's care and deeply worried about his recovery. It also reconnected me (one gets very isolated when one has a sick animal) with the caring of a special group of people who have dedicated themselves to helping dog lovers during some of their most difficult times.